We played our 4th game yesterday in our Crossroads: Closing the Gap campaign at Mike's House in Rhode Island. It was a very pleasant drive and Mike's wife laid out a fantastic lunch of oxtail sliders and some French onion soup. Really a great day out aside from the fact that my tactical abilities (I am not sure if I actually ever had any ability) abandoned me completely. Anyway on to the game. This was the last scenario in Stage 1 of the campaign. 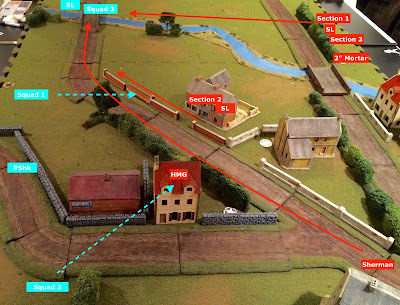 In stage 1 you move from scenario to scenario with the Canadians as the attacker. Their general instructions are to take the village. I had won 2 games and Mike one. 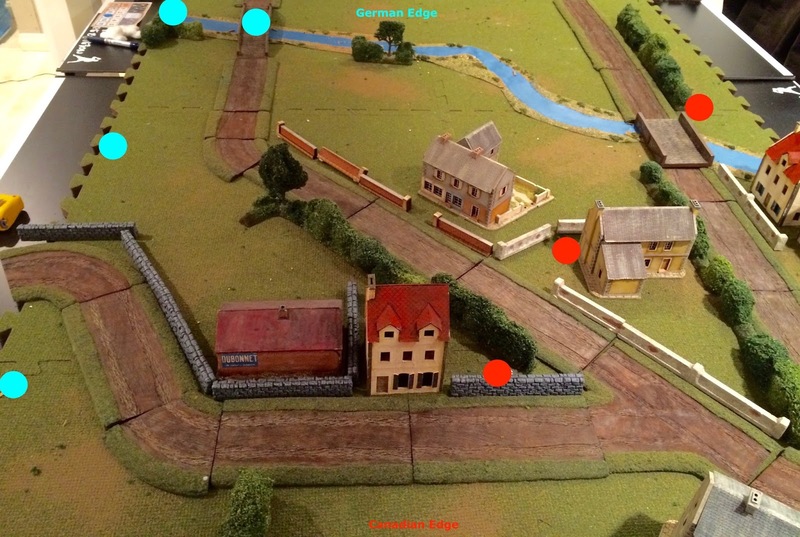 This is played as scenario 6 from the rulebook: Attack on an Objective. 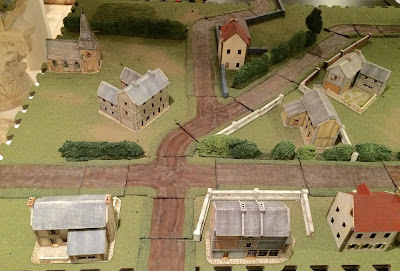 In stage 2 of the campaign the Canadians are in the village and have to defend it against a counterattack from German paratroopers. Anyway I had 12 supports and Mike 6. I took a Sherman, a Vickers MMG team and 2" Mortar. Mike took a extra Panzerschrek, an adjutant and a sniper. 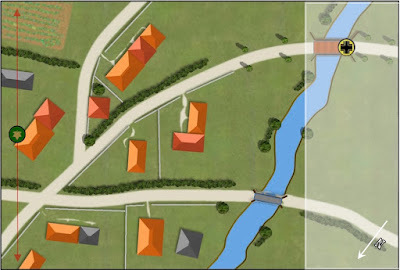 Looking from the Canadian entry point, the objective is the bridge on the far left. 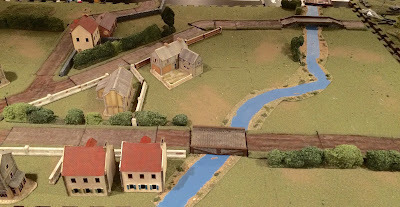 Another view from the Canadian right flank with the bridge objective in the right farground. Concentration of buildings on the Canadian end. 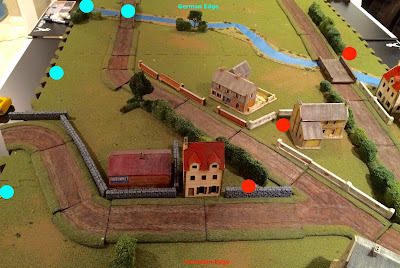 Patrol phase was a little unexpected with the Germans taking my left flank and me taking the centre. A Brief Synopsis of the Battle: I started the game off well with multiple (I think 4 double or treble 6's. 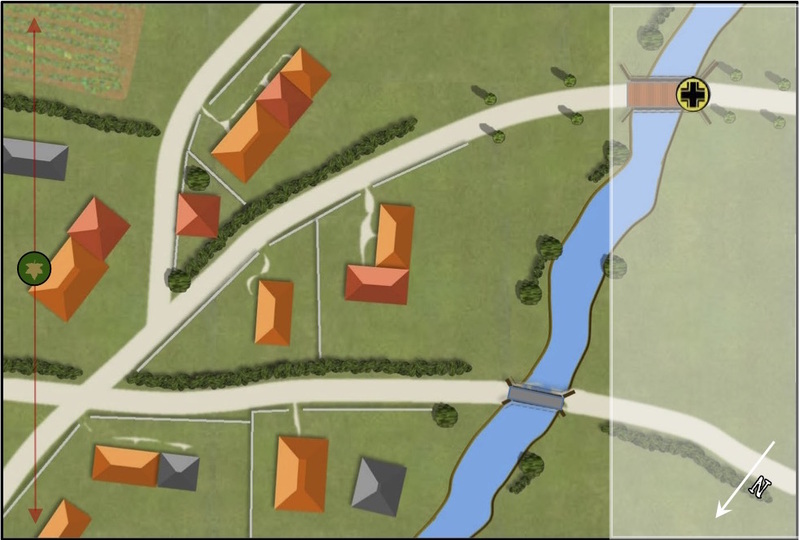 I initially laid down section 3 and the 2" Mortar team with the plan to lay down some smoke and advance my troops across the open field when I got my next double 6. Mike put his squad 3 down on the objective. 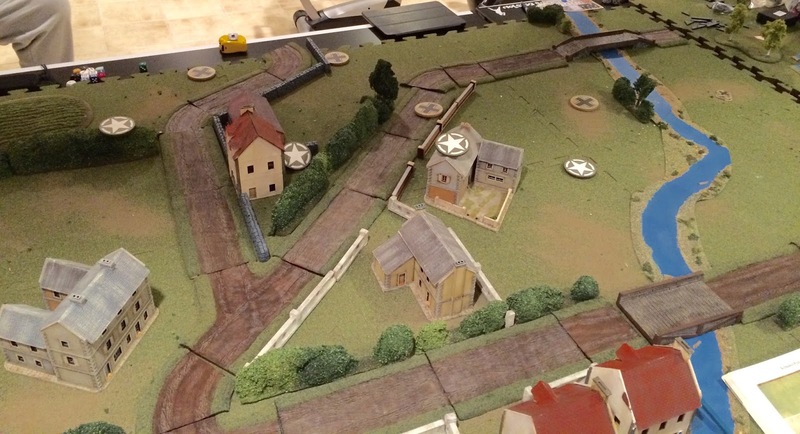 I then plopped down the HMG team and Section 2 to protect my left flank as well as putting down the Sherman and Section 1, both to advance to the objective. Mike had placed his squad 2 where the Panzerschreck marker is and had advanced into cover. So good so far but then I made my first blunder by advancing the Sherman up the middle road rather than the road on my right flank. I thought I was protected by the smoke, but I missed that Mike could lay down a Panzerschrek on my left flank. Despite an obscured view, he threw a 9 and had a hit, 13 d6 against 7, I believe he had +7 hits, up goes the JL and the tank and I end up taking -4 on my morale for the 2 tests. I think I then got rattled. I had been hesitant for reasons unknown to advance Section 1 and 3 towards the objective. I had also left the Vickers without a leader to remove shock. 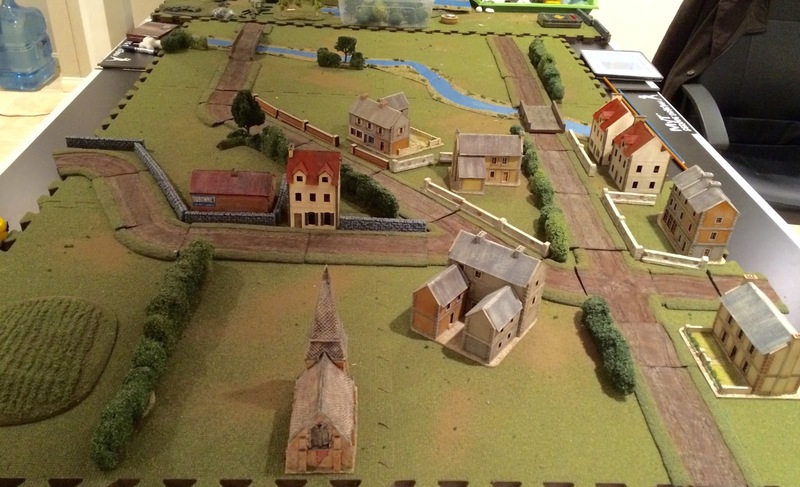 Despite initially causing significant casualties to the German squad 2 and taking out squad 3, the HMG team started to take casualties and unfortunately now I was completely bereft of 1's on my CD. Then I made blunder 2 and for some reason that escapes me, I decided to have section 2 with the SL exit the house where they safely were in cover. By then Mike had started to get double 6's and my dice had failed me. He laid down squad 1 who mowed down my section 2 including the JL and the SL, my morale dropped to 2. The game was over. Mike played a good defensive game putting down his troops when they were most needed. My tactics were poor and I forgot all about using overwatch and tactical markers, so I lost. But still a great game. The Panzerschrek is a vicious weapon. Well both my CO's as well as the men's opinion of my leadership has taken a plunge. I did get 6 replacements though and I feel ready to take on the fresh unit of German Fallschirmjägers. On to scenario 5 of an excellent campaign. Well we now switch to stage 2 of the campaign, I am looking forward to being the defender, my favoured position. Nice batrep and great looking game table! Thanks, I am trying to duplicate your efforts with the bamboo forests now. 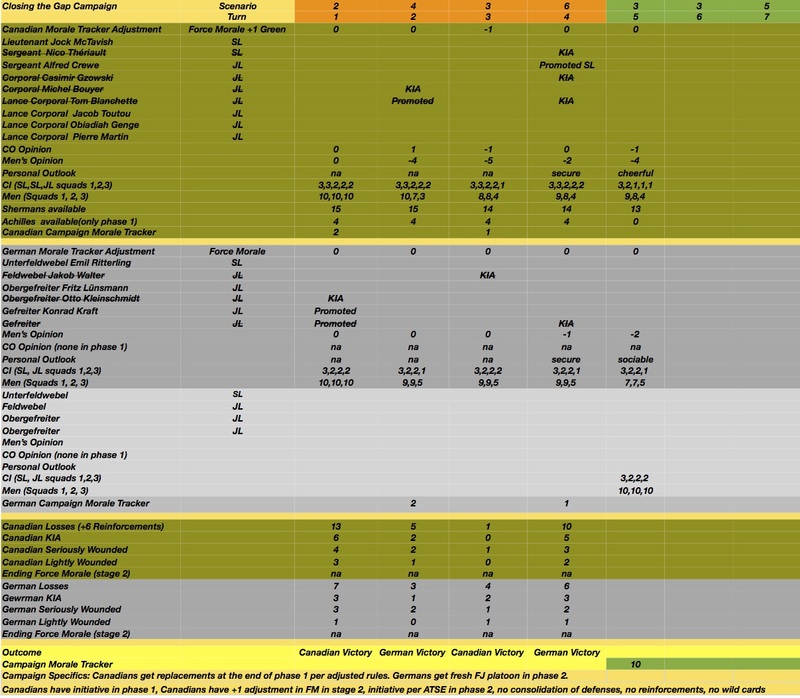 Great looking table and AAR, shaping up to be a great campaign. What makes the campaign great is that both players get to play the attacker and defender. A big learning curve and we have all been there. Two games each, so a good balanced campaign so far John. Thanks Pat, Maybe I need to play a little more frequently then every couple of months. oxtail sliders and some French onion soup? Maybe the lunch did make me a little soporific! Very nice AAR John - must get my hands on that campaign myself as it looks sensational. Great looking game and a delicious sounding lunch menu! You are a lucky guy! Well, except for the outcome of the game. Interesting game, the patrol phase really threw you a curve ball! 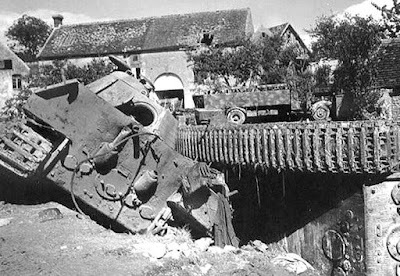 Think you might have short-changed yourself on the loss of the Sherman though. You don't have to roll twice just because it's got a JL on board. You just make one roll for "support unit lost". Really want to play this campaign myself, but between Martlet, Scottish Corridor and this I think I'm going to be stuck in Normandy until the cows come home. Thanks Andy. 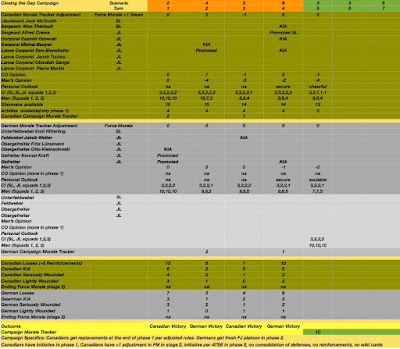 I think you may be wrong about the Sherman, if it explodes as it did it is 2 morale tests, it it gets knocked out the crew escape and it is 1 morale test. Check on the forum.